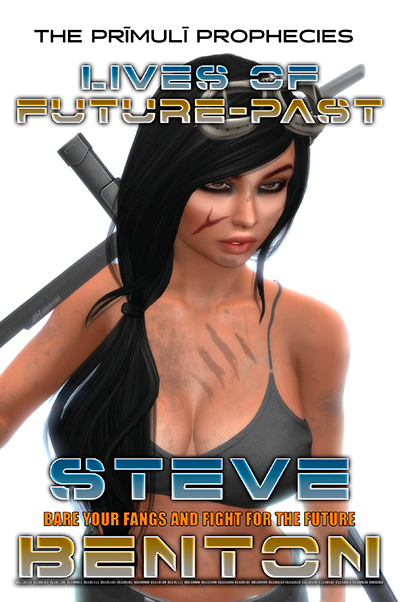 "Lives of Future-Past" is the first installment in The Prīmulī Prophecies, a sci-fi/fantasy series created by author Steve Benton. With elements of science, magic, supernatural beings and time travel, this all-new combined take on familiar subjects appeals to fantasy fans, gamers, manga-heads, sci-fi freaks and lovers of everything lycan (we're not so sure about vampire lovers, because vamps are really nasty, horrible smelly creatures in this universe). And yes, there's also a ton of romance. The people of Max and Jennie's home world are a combination of Americans, Australians, Swiss, Peruvians, Chileans and Argentinians, with the aforementioned pair being of Argentine extraction, and known as degos. The English language has been peppered with Spanish and German words, and on purpose by the author, as he is fluent in both English and Spanish (and speaks some German). He also has homes in both North and South America, and has traveled extensively throughout the world (all descriptions of Lima, Peru and in Machu Picchu come from his personal experiences there). Components of online video games, such as a standard levels meter (strength, health, stamina) is part of a lycan's peripheral vision, and Max is limited by a skills timeout much like one encounters in any magic-based MMORPG. This adds a vulnerability to the protagonist and balances out his awesome, developing powers.